Today’s blog post is from Jill Henning, Pastor of Faith Development at Trinity Lutheran Church in Lilburn, Georgia. The day of Epiphany has become a special celebration within my congregation, Trinity Lutheran Church in Lilburn, Georgia. 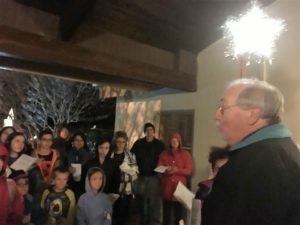 In an area where most of the Christmas decorations are put away before the New Year and the world has grown a little darker without Christmas lights, we gather under a lit star to carry that light out into the world. Several years ago we were able to find a battery operated star that we place on a long pole, then one of our youth is chosen to bear that light into the world. We gather around the baptismal font with the star and pray that God might bless our homes and that we might be the light shining in our world. We hear again the passage from Matthew of the Magi’s journey to find the Christ child and then sing as we process to the front door of the church. This door is marked with chalk, “20+CBM+17,” the year with the initials of “Christus Mansionem Benedicat” – May Christ Bless the House. From the front door everyone is given a branch of evergreen and we sing “We Three Kings” as we process to our labyrinth to celebrate. 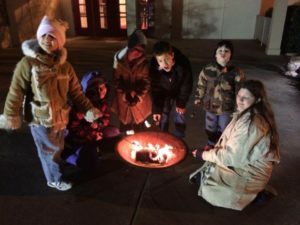 While traditionally the three gifts brought to the Christ Child were gold, frankincense and myrrh, at Trinity we bring our evergreen to be burned in a fire pit and everyone enjoys our own three gifts of Epiphany: graham crackers, marshmallows and chocolate. The night ends with the greens burned, the reading of John 1:1-4, 14, 16 and the making of s’mores. In bleak, cold winter’s night light shines in the darkness and laughter fills the sky. As pastor I get to enjoy my own tradition of seeing which of our youth can roast the perfect marshmallow, with me as the judge and official Epiphany taste tester. For those unable to attend we also provide a home devotion so their homes can be blessed and marked for the New Year. May your home be blessed this Epiphany and may your light so shine before others that they may see your good works and glorify your Father in heaven.